Arsenal may have to pay up to €44 million [£35m] in order to sign Mario Balotelli if AC Milan get their way, The Insider has learned. Goal revealed earlier this week that Arsene Wenger and the player’s agent Mino Raiola were due to meet in Brazil – where the Arsenal manager is currently working as a pundit on French television – on Saturday, with a view to thrashing out a deal for the controversial Italy striker. Arsenal were hopeful of being able to sign the former Manchester City star for around €31m [£25m] but Milan have issued Raiola with a mandate to get an extra €12.5m [£10m] from any potential buyer. Having missed out on Champions League qualification Milan are willing to let their star player leave, but with Manchester City due to receive a 20 per cent sell-on fee the Italian giants are hoping to drive up the asking price. Balotelli has scored 28 goals in 51 appearances for Milan since returning to Serie A in January 2013 and was coy when questioned about his future ahead of Italy’s shock 1-0 World Cup defeat against Costa Rica on Friday. “I’m concentrating on the national team and the World Cup,” he told reporters. 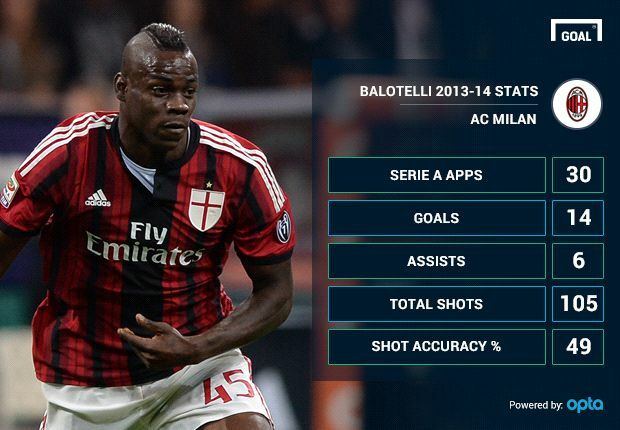 “Only eight or 10 clubs in the world can afford Mario Balotelli – like all premium players, and he is one of the greatest.